About 225 Mexican gays and lesbians, half from México and half from the U.S., walked the length of Tijuana's glitzy and rowdy Revolution Avenue on a mid-June Saturday afternoon, to loud cheers from both supporters and hundreds of surprised shoppers and partiers. 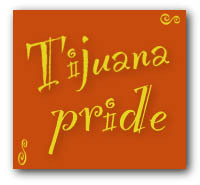 It was Tijuana's third annual gay/lesbian pride march down the city's busiest street. Another 200 or so people walked the entire route on the sidewalk, likely avoiding the street due to the presence of TV news crews. Other supporters, many wearing gay T-shirts or waving rainbow flags, cheered from the balconies of the large discotheques that line Revolution Avenue. Marching contingents included the organizers, Grupo ¿Y Qué? (And So What? Group), the Mobilization in Memory of the Victims of AIDS, AIDS Project Mexicali (Mexicali, a desert city of 1 million people, located 120 miles east of Tijuana, is the capital of Baja California), Mexicali Pride (which will be held Sept. 20), Gay & Lesbian Latinos con Orgullo, the Imperial Court of San Diego County, the Metropolitan Community Church and Long Beach Pride. "I think it's about time for this kind of movement because this is a community that everybody should respect for their courage to be recognized," said Adriana Cortez who was driving the Televisa- Channel 12 news van. "There's a lot of people in Mexican society that hide their homosexuality. I don't share [their sexuality] at all but I think they're citizens like any other Mexican person." As in previous years, a 10-piece mariachi band followed behind the lead banner. The half-hour march ended with a rally in a park followed by a dance at Mike's, Tijuana's most popular gay disco. Although there were no anti-gay incidents during the parade, organizers José Navarro and Alejandro García received six telephoned death threats at their home in the days leading up to the march. "They called after we advertised the march and put our phone number in the media," said Navarro "The threats came in early in the morning -- different voices. They said they were going to shoot us and kill us all because we had no right to be marching. It was annoying." This year's march was dedicated to García -- one of the two founding fathers of Tijuana gay activism. Navarro said García has been very ill for the past three months. Last year, about 300 people marched. The first march, in 1995, attracted 85 pioneers. Tijuana's population is not known but estimates go as high as 2 million, making it the second-largest city on the West Coast. © 1997 BEI; All Rights Reserved.